Today I picked my first large batch of fresh spring peas. My kids ate most of them right off the vines, because the peas are so sweet. This is one of the vegetables to consider growing in your garden, as it is difficult to find freshly picked peas and there is nothing like the taste. 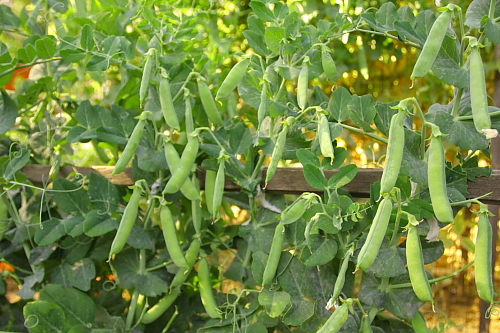 Peas are best eaten right after they are picked. 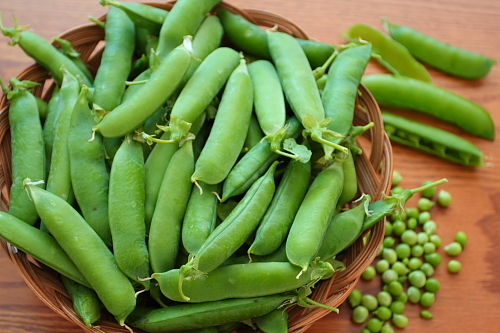 Look for fresh peas at the farmer's market. Make sure the pea pods are fresh, firm and shiny. Open one and taste the peas. They should be sweet and full of moisture. If they are starchy and tough, don't buy them. They have been sitting too long and the sugar has turned into starch. Growing up in Calabria, my mother would always fix pasta with fresh peas, cooking the tiny pasta tubes called "ditalini", and adding the peas in the same pot with the pasta towards the end of the cooking. She mixed the drained pasta and peas with a simple tomato sauce. I used to love this dish as a child because a lot of the peas would hide inside the tiny pasta, as if someone had filled the tubes with peas. 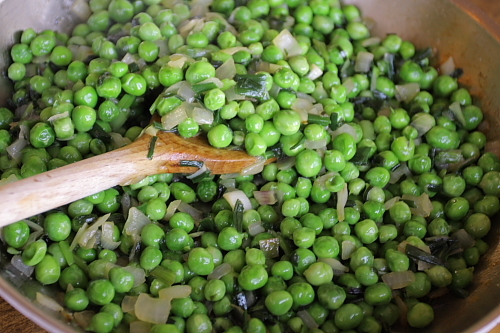 Another way I enjoy fresh peas is to sauté them with onions and olive oil as a side dish. It is so simple that you don't even need a recipe, but I will attach one so if you find fresh peas at the farmers market you can try it. Kids love peas prepared this way. In a 12-inch sauté pan, warm the olive oil over medium heat. Add the chopped onion and sauté over high heat for about 2 minutes until soft. Add the peas, salt and pepper to taste. Sauté for 4-5 minutes until peas are tender.